Did you invite your friends over for dinner, but haven’t actually thought of the main course yet? Or you told your date you would be cooking dinner at your place, but don’t really know how to cook? Then this is the recipe for you. 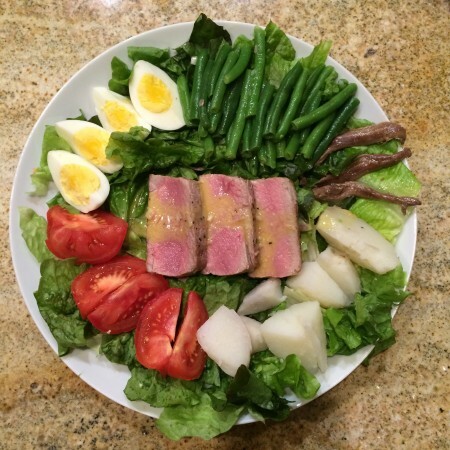 Salade nicoise is a complete meal on its own that leaves you feeling fresh yet also satisfied. A quick, simple, fancy but still healthy meal. One of your friends is a vegetarian? No worries, simply put the green beans as the center piece instead of the tuna. Everything can be found with a quick trip to the grocery store, if not already in your fridge. Assemble the plates, light some candles, pour some drinks and you’re ready to sit down and enjoy. 1. For the dressing, whisk together all the ingredients, then set aside. We all know that dressing can save a dish or elevate it to a new level. The vinaigrette for this recipe is no exception. 2. Boil or steam the green beans in a pot until tender but still firm, then take out and let chill in a bowl of ice water. In the same pot, boil the potatoes and eggs until fully cooked. 3. Drain and soak the anchovies in water before using to reduce the saltiness. For those who love anchovies, they’re already an essential pantry ingredient, and you can leave them whole to put in the salad. If you’re a little hesitant about them, finely chop them and whisk into the dressing so there is just a hint of flavor instead of an entire fillet in your salad. 4. Cut the green beans into segments, halve the eggs lengthwise twice into quarters, and cut the tomatoes into wedges. If the expected wedges are too ordinary, chop them into asymmetrical chunks. It’s your plate, your rules. 5. Drain the tuna and break it into large pieces. Alternatively, if you want a fancier meal, you can pan-sear a raw tuna steak, coated with olive oil, salt and pepper, for about one and a half minutes on the first side and one minute on the second side. Let that sit for a few minutes before slicing. 6. Before assembling, toss the green beans in some of the dressing. 7. First, lay down a bed of lettuce in each plate, then arrange the eggs, tomatoes, potatoes, olives, anchovies and green beans around the plate. Place the tuna in the center. Finally, drizzle the dressing all over before serving. Contact Stephanie Wang at [email protected].